If you arrive to Milan by airplane, you are going to land at one of the following airports: Malpensa International Airport, Linate Airport and Bergamo Orio Al Serio Airport. There are several services (public and private) that connect the Milan city center with the Milan Airports. Please find here all information about the airport transfer services. CALL CENTER SEA: +39.02.74852200 - Information on: domestic and international arrivals and departures, operative information, export and import cargo storage, general information. Lost property service +39.02.74862900 - from Monday to Friday from 10.00 a.m. to 17.00 except holidays. Malpensa International Airport (Airport Code - IATA: MXP, ICAO: LIMC) is located in the province of Varese, near Milan. It is one of two main international airports in Milan. Malpensa is one of the two hubs of Alitalia, the Italian national flag carrier, with over 19,6 million passengers in the year 2005. Malpensa is the most important international airports in Italy, along with Leonardo da Vinci International Airport (Rome) and serves a population of over 15 million people. 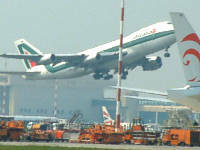 Major renovations took place in 1998 and after that many flights were transferred from Linate to Malpensa. Malpensa International Airport has two terminals, Terminal 1 for commercial traffic and Terminal 2 for charter and low-fares traffic. 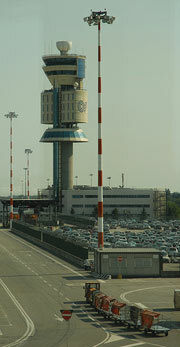 Terminal 1 at Malpensa is used by most of the major airlines. Only a few flights leave from terminal 2. Milan Airport Private Arrival Transfer - Who wants to arrive in a foreign country after a long flight and battle the local public transport system? Take the hassle out of arriving into Milan by prebooking your Milan Airport Private Arrival Transfer before you leave. Be delivered directly to the door of your hotel for the most relaxing start to your holiday. Milan Airport Private Departure Transfer - You have seen the sites, indulged in lovely Italian food, and shopped to your hearts content. Regrettably it is time to leave the cosmopolitan city of Milan, why make the day harder than it has to be. Prebook your Milan Airport Private Departure Transfer to ensure a smooth departure from your hotel for your flight home. The "Malpensa Express" train service runs from Stazione Cadorna railway station, Piazzale Cadorna, Milan. Trains run from 5.50 to 20.20 every half-hour, with extra trips at 05.00, 21.20, 22.20 and 23.10 by bus. You have to stamp the ticket using the machines on the platform before getting on the train. The "Malpensa Shuttle" coach service runs every 20 minutes (fewer trips early and late) from 4.30 until 00.15, from Milan Central Station, Piazza Luigi di Savoia. Stops at both Terminal 1 and 2. The "Malpensa Bus Express" coach service runs every 30 minutes from 5.15 to 22.35, from Milan Central Station, Piazza Luigi di Savoia. Milan-Malpensa by taxi: if you take a taxi to/from Malpensa, make sure that it has the sticker "Taxi autorizzato per il servizio aeroportuale lombardo" on the windscreen. This means that its taximeter is adjusted for this route and that you pay the displayed fare. Other taxis without the sticker may double the fare. Malpensa-Linate coach service: Malpensa Shuttle coaches leave Linate from 6.00, every 90 minutes; departures from Malpensa run from 8.00 to 21.30 every 90 minutes. Linate Airport (Airport Code - IATA: LIN, ICAO: LIML) is the city airport of Milan. Due to its vicinity to Milan, it is mainly used for domestic and short-haul international flights, with over 9 million passengers in 2005. This name comes from the small village where it is located. Its real name is "Airport Enrico Forlanini", from the Italian inventor and aereonautical pioneer born in Milan. It was built in the 1930s (and completely rebuilt in the 1950s and in the 1980s). Linate airport is 7 km from the city centre. ATM Bus n° 73 (Public Transportation) - From Linate to Corso Europa / Piazza San Babila. STAM coach service - From Linate to the Central Station, Piazza Luigi di Savoia. Milan-Linate by taxi: if you take a taxi to/from Linate, make sure that it has the sticker "Taxi autorizzato per il servizio aeroportuale lombardo" on the windscreen. This means that its taximeter is adjusted for this route and that you pay the displayed fare. Other taxis without the sticker may double the fare. Orio al Serio International Airport (Airport Code - IATA: BGY, ICAO: LIME) is an airport located in Bergamo, near Milan, and it serves the low-cost traffic of Milan. The airport served over 4.3 million passengers in 2005 and it's the most important low-cost airport in Italy. The airport, with Linate Airport and Malpensa International Airport, forms Milan's airport system, the most important of Italy. Terravision Low Cost Express Coach - A coach service run by Terravision and Autostradale leaves from the Air Terminal to/from Milan Central Station (Piazza Luigi di Savoia). Thanks to the partnership with Terravision, now you can book directly with us your express low-cost airport transfer to/from Milan Bergamo airport direct to/from Milan Centrale Station. Milan-Orio Al Serio by taxi: the taxi area is located outside the arrivals. If you take a taxi to/from Orio Al Serio, make sure that it has the sticker "Taxi autorizzato per il servizio aeroportuale lombardo" on the windscreen. This means that its taximeter is adjusted for this route and that you pay the displayed fare. Other taxis without the sticker may double the fare.